In this latest edition of eLearning TrendWatch, it’s time to see what the latest developments are regarding augmented learning. 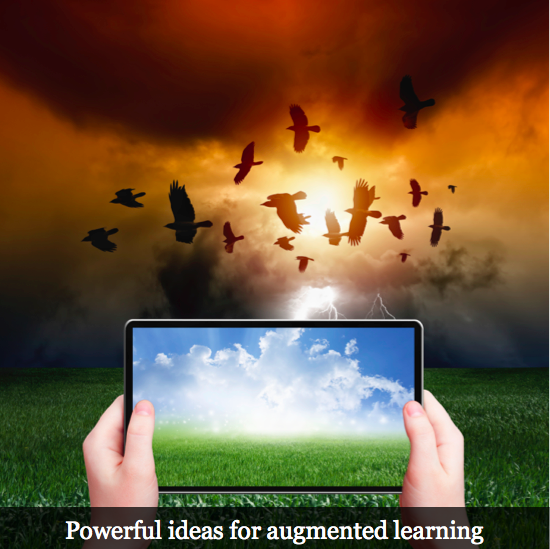 If you haven’t kept up with it, augmented learning is a kind of learning that is both on-demand and one in which the environment adapts to the learner. There are all kinds of ways to make this happen incorporating a variety of augmented reality tools and techniques. You might think that QR codes are already a thing of the recent digital past, but they still represent and interesting basic on-demand tool that fits of the augmented bill of quick access to information. One application of QR codes would be in the manufacturing world. In this scenario, a piece of equipment might be decorated with a variety of QR codes that provide instant access to employees about that part of the machine for super-fast troubleshooting and training. By using QR codes in this way, companies avoid the time-consuming process of having workers access information about equipment through physical manuals with their mind-numbing reference indexes. Being able to access this kind of information in real-time can help minimize down time and getting things back on track after a shut-down. But manufacturing isn’t the only place where QR codes can be used. When you think about it, QR codes could be utilized to provide quick access to information about any process, however simple or complex it may be. There was a time not too long ago when speaking to an inanimate object and getting real, useful information back was the stuff of science fiction writers. Now we regularly talk to devices and platforms to ask for information and somehow, miraculously, we get the information we’re looking for, at least in an ideal world. We do it in our cars and we do it through automated phone systems from all kinds of companies. It’s become rather commonplace. Now think about adding a voice-activated interface to your LMS. Kind of exciting, right? Consider the manufacturing world again. You might find yourself asking aloud, “How do I clear a jam in the XYZ” piece of equipment. The system could also be configured to respond such words as “emergency” and the keywords that follow to quickly respond to immediate injuries. Voice-activated systems have already been in use for patient care in the medical world for more than a decade! Voice-activated learning, training, and workflow processes can be implemented in just about as many scenarios as the QR codes mentioned above. This one is based on technologies developed in the realm of espionage called RFID – radio frequency identification. What it does is track location using really tiny components, which might be no larger than a grain of rice. RFID can be used to track vehicles of all types, or the stuff being carried in those vehicles. The information contained in the tracking chip can be read by a variety of devices equipped with RFID technology, such as smartphones and tablets. The reading capability is achieved through a huge variety of apps. RFID has already made its way into the retail industry, where it has been deployed in ways to assist and enhance the consumer’s shopping experience. There are grocery stores whose shopping carts are equipped with screens so that as you move through the store, the RFID conveys messages about particular products in that section of the store. It’s all about providing customized information on demand, which means it can be applied to eLearning and especially mLearning. And employee orientation could be handled in this way so that as the learner moves throughout the organization, training information specific to that location pops up on the mobile learning device, opening up a whole brave new world for self-directed training and learning. As you can see, even these first few ideas for augmented eLearning are powerful ways to get people the information they need where and when the need it most. This is a rapidly evolving field, so you can be sure that future editions of TrendWatch will have more to say on the topic of augmented eLearning.